"While operating and maintaining our facility we will never risk the health and safety of our employees, contractors, visitors, or community for any reason"
It's trash day and you bring your can of garbage to the end of the driveway or toss it in the dumpster. If you live in Eastern Massachusetts, there's a good chance we're making electricity out of your garbage. 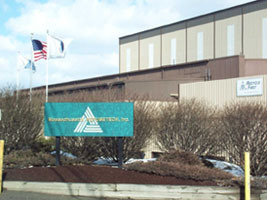 We're Wheelabrator North Andover, Inc. (or WNA) operators of the modern waste-to-energy facility located in North Andover, Massachusetts. Today, thanks to modern waste-to-energy plants such as Wheelabrator North Andover, our trash is converted into a useful product: safe and clean energy that lights our homes, runs our appliances, and keeps many of us warm in the winter. This takes the place of the coal and imported oil (or fossil fuels) that we traditionally depend on as fuel for making electricity. Here we convert more than 1,500 tons of trash every day into enough electricity for almost 35,000 homes in the Merrimack Valley. As you visit our web site, enjoy learning about how electricity is made from trash and how our plant is part of today's waste management solution. We hope you find our web site informative. Please visit frequently as updates are made often! We encourage you to call or write us if you have any questions. You will also find links to related government and industry organizations, as well as photos and descriptions of modern combustion and air pollution control equipment. 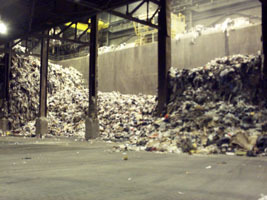 We hope this site helps answer any questions you may have about what to do with all our trash! And if you would like to see this unique solution in person, please call Scott Emerson at 978.688.9011 to arrange a visit to our plant or email us at info@wheelabrator-northandover.com.